Apple chief executive Steve Jobs announced Monday he is taking a new leave of absence from the technology company "so I can focus on my health." Apple co-founder and chief executive Steve Jobs announced he was taking another medical leave of absence on Monday, reviving questions about the future of the global technology powerhouse. Jobs, 55, who underwent surgery for pancreatic cancer in 2004 and a liver transplant in 2009, said he would continue as chief executive "and be involved in major strategic decisions for the company." Wall Street was closed for a holiday but the surprise announcement that the iconic technology executive was facing renewed health issues sent Apple shares tumbling in Frankfurt, where they lost 6.57 percent to 243.10 euros. "At my request, the board of directors has granted me a medical leave of absence so I can focus on my health," Jobs said in a three-paragraph email to Apple employees that did not specify his latest medical concerns. Jobs, the Silicon Valley legend behind the Macintosh computer, iPod, iPhone and iPad, said chief operating officer Tim Cook would be "responsible for all of Apple's day to day operations" during his absence. Cook, 50, also took over when Jobs went on nearly six months of medical leave in 2009. "I have great confidence that Tim and the rest of the executive management team will do a terrific job executing the exciting plans we have in place for 2011," Jobs said. "I love Apple so much and hope to be back as soon as I can," he said. "In the meantime, my family and I would deeply appreciate respect for our privacy." Questions about Jobs' health have resurfaced periodically since the cancer diagnosis in 2004, and have been the subject of much debate among corporate governance experts over the obligations the company has to its shareholders. "Critics have contended that because he is such an aggressive, hands-on manager and engineered Apple's runaway success in recent years, it is crucial for shareholders to be better apprised of his health problems," TheStreet.com said. Noting that Jobs is "considered nearly the sole architect of Apple's huge success," Douglas McIntyre of 247WallSt.com said "forecasts that Apple's shares may hit $450 or $500 will have to be put off, perhaps indefinitely." Silicon Valley analyst Rob Enderle said Cook, the COO, has proved to be a competent manager but the challenge to the company without Jobs is "what will Apple do next?" "That is probably where Steve Jobs is going to be much missed," he said, adding that with each departure "there is an increasing chance that he won't come back." Jobs underwent an operation for pancreatic cancer in 2004 and received a liver transplant in Tennessee while on medical leave between January and June 2009. He returned to public view in September 2009 looking gaunt but healthy. The New York Times, citing "a person with knowledge of the situation," said Jobs suffers from immune system issues common with people who have received liver transplants and that his health has frequent "ups and downs." The announcement of Jobs' latest medical issues came with US markets closed for the Martin Luther King Jr holiday. 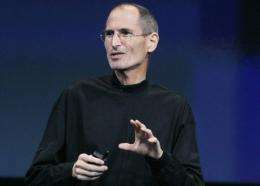 Apple shares tumbled in late 2008 when rumors swirled about his health after he failed to show at the Macworld Expo. Apple's share price has surged recently, however, on the success of the iPhone and the iPad and in May, the company surpassed Microsoft as the largest US technology firm in terms of market value. The company is scheduled to release its fiscal 2011 first quarter results after the markets close on Tuesday. Apple shares closed at a record high of $348.48 on Wall Street on Friday. Apple's fortunes have been uniquely linked to Jobs, who returned to the then flagging company in 1997 after a 12-year absence and introduced innovative and wildly successful products like the iPod, iPhone and iPad. Britain's Financial Times last month named Jobs its "Person of the Year" and even US President Barack Obama joined in the plaudits to the chief executive of the Cupertino, California-based gadget-maker. "We celebrate somebody like a Steve Jobs, who has created two or three different revolutionary products," Obama said. Jobs and Steve Wozniak founded Apple in 1976 and introduced the first Macintosh computer in 1984 along with innovations such as the mouse. Jobs left Apple in 1985 after an internal power struggle and started NeXT Computer and Academy-Award-winning Pixar, maker of hit animated films such as "Toy Story." Since Jobs' 1997 return, Apple has gone from strength to strength with the iMac in 1998, the iPod in 2001, iTunes in 2003, the iPhone in 2007, the App Store in 2008 and the iPad last year. I am sorry to say he does not look healthy at all or long for this world, it shoulda happened to Gates instead. While I have never owned any Apple product, and probably never will, I still wish him better health, and a long stay at Apple. The industry needs visionaries like Jobs.